Are you looking for the perfect Christmas gift? 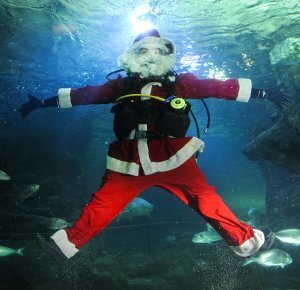 Buy our Christmas Voucher to dive with sharks at Deep Sea World, Scotland’s National Aquarium, and gift your loved ones this unique experience. Our 4.5 million litre Northern Seas display is home to one of Europe’s largest collections of sharks, as well as hundreds of other fish including stingrays and eagle rays. We are the only aquarium in Scotland to offer this kind of experience, meeting our 7 Sand Tiger sharks is guaranteed, and beginners are welcomed! Join us to live an unforgettable under the water adventure! To find out more information, and what to expect from our Shark Encounters, check out our Dive with Sharks page! PLEASE NOTE: Adult Christmas gift vouchers are valid from January 2019 for the next 6 months from Christmas. Junior Christmas vouchers are valid from March-October 2019. We recommend that all customers read through the information about each offer supplied in “Dive with Sharks”, as in most cases restrictions can apply. You need to check the medical requirements on the medical questionnaire. If you answer ‘YES’ to any of the questions on the medical form, you will require a doctors permission to dive. If all of your answers are ‘NO’, please just come along – you will fill out a form when you get to the aquarium on the day of your dive. PLEASE NOTE: Once a ticket has been purchased, you must then book a dive slot. Please call the aquarium on 01383 411880 to book your dive. We recommend booking at least eight weeks in advance. Gift vouchers purchased online will receive a PDF version of the Shark Dive Voucher as an email attachment. Please check that your Junk mail / Spam filter will allow this.